For other uses, see Alexander Island (disambiguation). Alexander Island, which is also known as Alexander I Island, Alexander I Land, Alexander Land, Alexander I Archipelago, and Zemlja Alexandra I, is the largest island of Antarctica. It lies in the Bellingshausen Sea west of Palmer Land, Antarctic Peninsula from which it is separated by Marguerite Bay and George VI Sound. George VI Ice Shelf entirely fills George VI Sound and connects Alexander Island to Palmer Land. The island partly surrounds Wilkins Sound, which lies to its west. Alexander Island is about 390 kilometres (240 mi) long in a north-south direction, 80 kilometres (50 mi) wide in the north, and 240 kilometres (150 mi) wide in the south. Alexander Island is the second largest uninhabited island in the world, after Devon Island. Alexander Island was discovered on January 28, 1821, by a Russian expedition under Fabian Gottlieb von Bellingshausen, who named it Alexander I Land for the reigning Tsar Alexander I of Russia. What in fact is an island, was believed to be part of the Antarctic mainland until 1940. Its insular nature was proven in December 1940, by a two-person sledge party composed of Finn Ronne and Carl Eklund of the United States Antarctic Service. In the 1950s, a British base administered as part of the British Antarctic Territory was constructed as Fossil Bluff (Base KG). 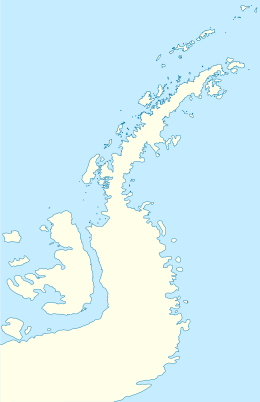 The island was claimed by the United Kingdom in 1908 as part of the British Antarctic Territory. Territorial claims have also been set by both Chile (in 1940) and Argentina (in 1942). Currently, under the Antarctic Treaty no claim has been officially recognized. The island contains the British Fossil Bluff meteorological centre and refuelling base. The surface of Alexander Island is predominantly ice-covered. There exist some exposed nunataks and a few ice free areas, i.e. Ablation Point Massif, of significant size. The nunataks are the peaks of north-south trending mountain ranges and hills. They include the Colbert, Havre, Lassus, Rouen, Sofia University, Walton mountains, the Staccato Peaks, the Lully Foothills, the Finlandia Foothills, the Elgar Uplands, and the Douglas Range. These mountains, peaks, hills, and uplands are surrounded by a permanent ice sheet, which consists of glaciers that flow off of Alexander Island. These glaciers flow west into the Bach and Wilkins Ice Shelves and Bellingshausen Sea, and east into the George VI Ice Shelf. The George VI Ice Shelf is fed by both by outlet glaciers from the ice cap on Palmer Land and Alexander Island. Another notable feature of Alexander Island is Hodgson Lake. Hodgson Lake is a former subglacial lake that has emerged from under an ice sheet that had covered it. Hodgson Lake is 2 km (1.2 mi) long by 1.5 km (0.93 mi), and has a 93.4 m (306 ft) deep water column that lies sealed beneath a 3.6 to 4.0 m (11.8 to 13.1 ft) thick perennial lake ice. The northern side of Hodgson Lake is bounded by the Saturn Glacier, which flows east into George VI Sound, while the southern side of Hodgson Lake is bounded by the northern face of Citadel Bastion. During the Last Glacial Maximum, Hodgson Lake was covered by the ice sheet at least 470 m (1,540 ft) thick. This ice sheet started thinning about 13,500 years ago. It retreated and left Hodgson Lake covered by perennial ice sometime before 11,000 years ago. This lake has been covered by perennial ice since that time. Brahms Inlet (71°28′S 73°41′W﻿ / ﻿71.467°S 73.683°W﻿ / -71.467; -73.683) is an ice-filled inlet, 25 nautical miles (46 km) long and 6 nautical miles (11 km) wide, indenting the north side of Beethoven Peninsula on Alexander Island between Harris Peninsula and Derocher Peninsula, while the headland Mazza Point lies immediately northeast of the inlet and Mount Grieg lies immediately southeast of the base of Brahms Inlet. It was observed from the air and first mapped by the Ronne Antarctic Research Expedition (RARE), 1947–48, and re-mapped from the RARE air photos by Derek J.H. Searle of the Falkland Islands Dependencies Survey in 1960. It was named by the UK Antarctic Place-Names Committee after Johannes Brahms, the German composer. Harris Peninsula (71°31′S 74°6′W﻿ / ﻿71.517°S 74.100°W﻿ / -71.517; -74.100) is a broad snow-covered peninsula surmounted by Mount Lee, between Verdi Inlet and Brahms Inlet on the north side of the Beethoven Peninsula, located in the southwest portion of Alexander Island, Antarctica. It is one of eight peninsulas of Alexander Island. It was photographed from the air by the Ronne Antarctic Research Expedition, 1947–48, and mapped from these photographs by D. Searle of the Falkland Islands Dependencies Survey, 1960. It was named by the Advisory Committee on Antarctic Names for Commander Michael J. Harris, U.S. Navy, Commanding Officer of Squadron VXE-6, from May 1982 to May 1983. Liadov Glacier (Russian: Lednik Liadova;(Ледник Лядова) 71°32′00″S 73°45′00″W﻿ / ﻿71.53333°S 73.75000°W﻿ / -71.53333; -73.75000) is a glacier flowing east-northeast from Harris Peninsula, Alexander Island, into Brahms Inlet. It was named by the USSR Academy of Sciences in 1987 after Anatol Liadov (1855-1914), a Russian composer. Except for a 10 to 30 km (6.2 to 18.6 mi) strip along its eastern edge, the bedrock beneath the ice sheet, which covers Alexander Island, consists of a complex assemblage of metasedimentary and metavolcanic rocks. These rocks, which are locally overlain and intruded by igneous rocks, are known as the "Lemay Group." These terraines consist of turbiditic sandstone (subgraywacke and arkose) interbedded with secondary siltstone, mudstone, tuff, volcaniclastic sedimentary rock, agglomerate, and conglomerate, which have all been metamorphosed to prehnite–pumpellyite to blueschist facies. These metasedimentary rocks contain poorly preserved ammonites, pelecypods, gastropods, radiolarians, and fragmentary plant fossils. The LeMay Group also contains north-south, fault-bound slices of accreted ocean floor, ocean islands and seamounts, which includes pillow basalts, volcaniclastic sedimentary rocks, and chert. The rocks, which comprise the LeMay Group are asymmetrically folded and thrust faulted to the west, contain chaotic zones, and exhibit abundant coeval soft-sediment deformation. Based upon biostratigraphy, the oldest known rocks found within the LeMay Group are Lower Jurassic and range up to late Lower Cretaceous. The oldest rocks within this group may date back to Permo-Carboniferous times (350–260 million years ago). The LeMay Group is interpreted to be an accretionary prism that was built out from the west (fore-arc) side of a long-lived magmatic arc, the roots of which are now exposed on the Antarctic Peninsula, between Early Jurassic and Paleocene times, when subduction ceased. The easternmost 10 to 30 km (6.2 to 18.6 mi) wide strip of Alexander Island is underlain by a 7 km (4.3 mi) thick sequence of highly fossiliferous, shallow marine to subaerial fluvial sandstone, mudstone, and conglomerate of the Fossil Bluff Group. The marine strata within the Fossil Bluff Group contain numerous ammonites, belemnites, gastropods, pelecypods, and other marine fossils. The upper fluvial sedimentary rocks of the Fossil Bluff Group contain fossil forests with standing trunks as tall as 5.5 m (18 ft), other plant fossils, and associated paleosols as found at Citadel Bastion. These sedimentary rocks are essentially unmetamorphosed and gently folded. These islands and mountain ranges have been affected by strike-slip, normal, and thrust faulting at different times. As determined from the fossils found in it, the Fossil Bluff Group accumulated over a period of time ranging from Early Jurassic to mid-Cretaceous. The sedimentary rocks of the Fossil Bluff Group unconformably overlie and are faulted against the LeMay Group. Earth scientists argue that the Fossil Bluff Group accumulated within a fore-arc basin on the western side of a long-lived magmatic arc, the roots of which are now exposed along the Antarctic Peninsula. Two different groups of igneous rock terraines have been found within Alexander Island. One group of igneous rocks consist of volcanic and plutonic rocks of Late Cretaceous to Paleocene age. They unconformably overlie and intrude metasedimentary and other rocks of the LeMay Group and the sedimentary rocks of the Fossil Bluff Group. Some of these volcanic rocks consist of distinctive magnesium-rich andesites, which were created by the subduction of a segmented ancient mid-ocean ridge about 80 million years ago. Also there are several small outcrops of Neogene alkaline volcanic rocks, which formed after the cessation of subduction. Wikimedia Commons has media related to Alexander Island. ^ Siple, Paul (1963). "Obituary: Carl R. Eklund, 1909–1962" (PDF). Arctic. Arctic Institute of North America. 16 (2): 147–148. doi:10.14430/arctic3531. Retrieved 2013-01-19. ^ "Alexander Island". Encyclopædia Britannica. 20 July 1998. Retrieved 20 January 2015. ^ Mills, William (2003). Exploring Polar Frontiers: A Historical Encyclopedia (1 ed.). p. 9. ISBN 1-57607-422-6. Retrieved 20 January 2015. ^ Smith, J.A., M.J. Bentley, D.A. Hodgson, and A.J.Cook (2007) George VI Ice Shelf: past history, present behaviour and potential mechanisms for future collapse. Antarctic Science 19(1):131–142. ^ Hodgson D.A., S.J. Roberts, M.J. Bentley, J.A. Smith, J.S. Johnson, E. Verleyen, W. Vyverman, A.J. Hodson, M.J. Leng, A. Cziferszky, A.J. Fox, and D.C.W. Sanderson (2009) Exploring former subglacial Hodgson Lake, Antarctica Paper I. Quaternary Science Reviews. 28:23–24:2295–2309. ^ Hodgson D.A., S.J. Roberts, M.J. Bentley, E.L. Carmichael, J.A. Smith, E. Verleyen, W. Vyverman, P. Geissler, M.J. Leng, and D.C.W. Sanderson (2009) Exploring former subglacial Hodgson Lake, Antarctica Paper II. Quaternary Science Reviews. 28:23–24:2310–2325. ^ "Brahms Inlet". Geographic Names Information System. United States Geological Survey. Retrieved 2011-08-15. ^ "Harris Peninsula". Geographic Names Information System. United States Geological Survey. Retrieved 2012-05-24. ^ a b Macdonald, D.I.M. and P.J. Butterworth (1990) The stratigraphy, setting and hydrocarbon potential of the Mesozoic sedimentary basins of the Antarctic Peninsula. in B. John, ed., pp. 101–125. Antarctica as an exploration frontier; hydrocarbon potential, geology, and hazards. AAPG Studies in Geology. vol. 31 American Association of Petroleum Geologists, Tulsa,Oklahoma. ^ a b c Macdonald, D.I.M., P.A. Doubleday, and S.R.A. Kelly (1999) On the origin of fore-arc basins; new evidence of formation by rifting from the Jurassic of Alexander Island, Antarctica. Terra Nova. 11(4):186–193. ^ a b c Vaughan, A.P.M., and B.C. Storey (2000) The eastern Palmer Land shear zone: a new terrane accretion model for the Mesozoic development of the Antarctic Peninsula. Journal of the Geological Society. 157(6):1243–1256. ^ McCarron, J.J., and J.L. Smellie (1998) Tectonic implications of fore-arc magmatism and generation of high-magnesian andesites: Alexander Island, Antarctica. Journal of the Geological Society. vol. 155(2):269–280. This article incorporates public domain material from the United States Geological Survey document "Alexander Island" (content from the Geographic Names Information System).